Dreaded termites can cost you thousands in property damage. In fact, termite infestations often go unnoticed for years, until the floorboards and other wood structures begin to buckle, sag, or crumble, indicating a termite infestation. Termites generally enter your property either directly through wood structures or via discreet underground tunnels, such as with subterranean termites, where they remain hidden behind walls, floor coverings, insulation, and other construction, feeding on the inside of the wood, while the exterior of the structure remains intact, so you never know they are there present. In fact, without regular termite inspections, a single species can produce up to a million or more termites in just one colony, which can really wreak havoc on your wood structures. Our subterranean treatment is specifically designed to rid subterranean termites, which are the most common type of termite in our area. As stated earlier, they can also be the most problematic as they nest underground, which makes them harder to detect. Because the damage caused by subterranean termites can be extensive, it is important to act fast and thoroughly in order to rid your pest problem quickly. 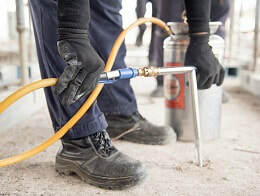 In most cases, we utilize a liquid termite barrier, which also works to eliminate termites at the root as well as discourage future infestations. The termite treatment systems we use are also environmentally-friendly, which means they minimize the risk of polluting underground water systems as well as unintended species.